K R CO #1 (1940) The 12 ton 32 foot scow K R Co #1 foundered February of 1940 in Nazal Bay, Atka Island. KACHOSAN MARU (1942) The 2,427 ton Japanese army cargo ship Kachosan Maru was sunk by an attack of U S B-26 aircraft November 27, 1942 at Attu. KAIYO MARU NO 12 (1982) The fish processor Kaiyo Maru No 12 was consumed by fire and sank September 30, 1982 approximately 15 miles north of Dutch Harbor. All 27 crewmembers were unharmed. KAMIKAZE (1989) The 32 foot aluminum salmon fishing vessel Kamikaze grounded in bad weather and was abandoned August 10, 1989 off Seguam Island. All four crewmembers made it to safety. KASHIMA MARU (1942) The 8,572 ton Japanese cargo vessel Kashima Maru (ex Kano Maru) was destroyed by United States bombers August 8, 1942 at Kiska. The vessel had been severely damaged by the U S submarine Grunion July 31, 1942 and was beached at Kiska. There the U S Naval bombardment of Kiska finished the Kashima Maru off. KATATA MARU (1971) The 310 foot Japanese fishing vessel Katata Maru rolled over and sank December 14, 1971 in the Bering Sea 20 miles from Adak. The flaming Katata Maru was being towed out of Adak Harbor by a Navy Tug. There was no one aboard the vessel when she sank. KATMAI (2008) The 93 foot cod fishing factory vessel Katmai foundered October 22, 2008 approximate 100 nautical miles west of Adak in the Aleutian Islands. Of the 11 crewmembers on board, only four survived. The vessel lost steering when her lazarette flooded as the Katmai was returning to Dutch Harbor from the fishing grounds with a load of codfish. She flooded from the stern in heavy weather. Lost were Cedrick Smith of Portland OR, Glenn Harper of Portland OR, Jake Gilman of Camas, Fuli Lemusu of Salem OR, Joshua Leonguerrero of Spanaway, Robert Davis of Deming and Carlos Zabala of Helena MT. KETCHIKAN (1974) The barge Ketchikan capsized and was lost July 1, 1974 off of the Aleutian Islands. Heavy seas washed 8,323 tons of oil pipe off of the deck of the Ketchikan causing the disaster. She was being towed by the tug Sudbury II. KIMBERLY (1985) The fishing vessel Kimberly sank May 20, 1985 approximately 80 miles northwest of Dutch Harbor. Ben Cantu (39) was lost and four other crewmembers were rescued. KING & WINGE (1994) The 97 foot wooden crab fishing vessel King & Winge flooded and sank February 23, 1994 approximately 22 miles west of Saint Paul Island in the Pribilof Islands. The King & Winge was built in 1914 and the oldest fishing vessel in the fleet. Both generators failed during fishing operations causing slack water in the fish hold, flooding and instability. Snow, freezing spray and 18 foot seas dampened efforts to save the vessel and contributed to the flooding. Pumps were dropped from a U S Coast Guard C-130 aircraft and brought over from the Coast Guard Cutter Hamilton. When all efforts failed, the U S Coast Guard Cutter Hamilton and fishing vessel Kona Kai rescued the four crewmembers from the King & Winge who abandoned ship in survival suits to a liferaft. KISKA (1970) The 70 foot wooden crab fishing vessel Kiska burned and sank February 9, 1970 in a cove in Kovurof Bay, Atka Island. The crew was rescued by the fishing vessel Kenivan Bay and transferred to the processing ship Northgate. KITTIWAKE (1990) The U S Fish and Wildlife Service vessel Kittiwake capsized January 29, 1990 at Adak. John Cantu and Karen Norton were lost. James Fuller and Heather Vose were rescued and taken to the hospital at the Naval Air Station on Adak. KLYUCHEVSKY (1961) The Soviet trawler Klyuchevsky disappeared 90 miles west of Saint Paul Island December 30, 1961. Searches by the United States Coast Guard and Russian vessels in the area found only a small amount of debris. KOTCHIRA MARU (1917) The 3478 ton Japanese steamer Kotchira Maru wrecked on the S.E. end of Amchitka Island July 27, 1917. The vessel was traveling from Japan to San Francisco carrying $400,000 worth of general merchandise. The crew of 49 escaped the disaster in three life boats. One reached Unalaska, one landed on Vancouver Island and the third was picked up by the vessel Santa Ana. The Santa Ana took the crew to Seward and then Seattle. KOTOHIRA MARU (1943) The 6,101 ton Japanese cargo ship Kotohira Maru was sunk by U S Army B-24 bombers January 6, 1943 off Holtz Bay, Attu Island. Only two crewmembers were rescued. KU SUN K (1990) The 32 foot fishing vessel Ku Sun K grounded after being struck by a wave September 14, 1990 in Cannery Bay. The operator swam to shore in a survival suit and walked to Dutch Harbor. 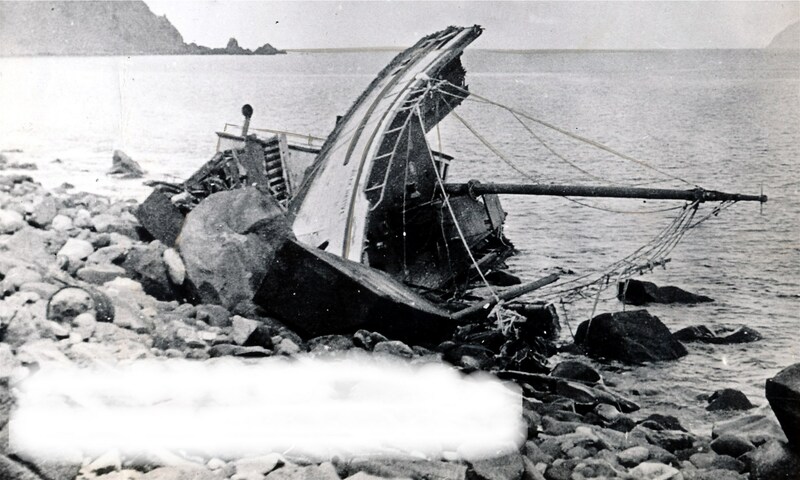 KUKUYOSHI MARU NO 15 (1969) The Japanese fishing vessel Kukuyoshi Maru No 15 grounded and was lost February 1, 1969 on Rat Island in the Aleutian Islands. The crew was rescued by a U S Coast Guard Helicopter and taken to Amchitka. There they boarded the Japanese Patrol Boat Erimo and were transported back to Japan. KYOWA MARU NO 11 (1984) The Japanese stern trawler Kyowa Maru No 11 sank after a collision with the Anyo Maru No 15 February 14, 1984 approximately 120 miles north of Atka. 14 crewmembers were lost and 8 rescued by the Anyo Maru. Gale force winds, a low ceiling and 25 foot seas hampered the rescue of survivors who were taken to Adak for medical treatment.